The term “forensic linguistics” first appeared in 1968 with relevant early research starting mainly in the UK and the USA. In the 21st century this field of applied linguistics saw a dramatic shift when corresponding professional associations such as the IAFL and some others started to emerge making it a discipline on its own. 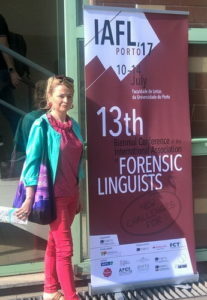 Still there are certainly issues facing this relatively new field and some of them were addressed by the world’s leading experts in forensic linguistics during plenary talks: https://iaflporto2017.com/keynote-speakers. The role of forensic linguistics in justice systems around the world is being questioned. There are some doubts as to how much and how exactly forensic linguistic evidence should be employed for “reasoned decision making” in courtrooms. Lawyers and linguists inadvertently have a different view on language in general. As a result, negotiating these differences and misconceptions that the former might have seems increasingly challenging. Should linguists work independently of lawyers or should both collaborate? The answer to this dilemma does not appear to be an easy one as was shown by a number of experts in the context of different countries and cultures. How should future linguists be trained and effectively see their career objectives and should people in law enforcement be taught some basics of the field as well? Obviously, the future and aspirations in forensic linguistics will depend largely on how these issues are tackled. There was an incredible amount of reports, presentations as well as a workshop https://iaflporto2017.com/forensic-linguistics-dojo/ covering different aspects of legal discourse, forensic texts (e.g., malicious messages, police interviews, reports, etc.) and the methods of dealing with them at different language levels. The members of the Lab found it particularly interesting to hear reports on authorship profiling, deception detection as well as anonymization and got a chance to have discussions with some experts in the linguistic text analysis and share our own experience of working on the corresponding issues. In the increasingly globalized world we also find bilingualism a critical issue that affects the interpretation of the legislation and interaction of all sides of legal processes in communities where more than one language (or a language variety) is used. The materials used for the research presented at the conference were produced both experimentally and in real-life settings. The corpus-based approach is also commonly used in the interdisciplinary field of forensic linguistics. We were honoured to have two reports (“Composition and Structure of the Russian Deception Bank Corpus Designed for Developing Methods of Text-Based Deception Detection” and “Linguistic Features of Internet Texts by People Who Committed Suicides”) accepted for the poster session that took part on July 12. It was great to talk to some of the colleagues we previously had a chance to meet during some other conferences as well as to get valuable feedback from other specialists. 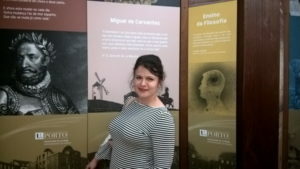 We were extremely delighted that they found the work we are doing at our Lab interesting and promising and even suggested some ideas for improving and collaborating particularly on cross-linguistic authorship attribution. Porto, Portugal’s second largest city, served as a breathtaking setting for scientific discussions. During the conference dinner we were able to have more informal talks against the backdrop of the beautiful River Douro spectacularly flowing into the Atlantic Ocean and of course taste the world-famous Port wine. Once again, we are privileged and delighted to have participated in this conference and have met a lot of colleagues whose feedback on our work we highly appreciate. Doing that in the thriving and vibrant Porto, the Best European Destination for several years, was an amazing bonus.